I saved everything when I was younger and my room was always a nightmare. And yes… that’s a picture of what my room looked like. It was always disorganized, always messy, and quite possibly a toxic wasteland. Embarassing. I used to seal up a large box of meaningful things each year and stash it away in the attic of my parent’s barn. Year books, notes, pictures, etc. Maybe I didn’t think there was an option to get rid of things or maybe, very likely, I didn’t want to part with memories. The pile of boxes in the attic became a mountain. There they sat, collecting dust. Since moving out after college, I’ve skillfully negated the task of going through these things; probably due to fear. My childhood was stored in those boxes. What would happen to my identity if I threw those things out? Could I still remember those fun times or life-changing experiences if I didn’t have physical proof that they happened? I avoided the project for years, until a recent trip home while my parents were cleaning out their barn and I needed to decide what to keep. I remembered carefully curating these boxes as a kid, so I was excited to unpack them. One-by-one, I dragged the boxes down from the attic and rather than lifting off the top of each box and peering into a glowing box of time-capsule magic, I was rather disappointed. “What? Why did I save all this?” The boxes contained junk. Well, not all of the stuff was junk, I did save one box of the most significant things. However, the rest was basically meaningless – bits of paper, every over-exposed and out-of-focus photograph, high school notes, my old retainer (gross), broken hair ties, dried prom flowers, chewed pencils, tons of school notes, birthday cards, every concert program… the list filled two giant garbage bins. Actually, over the week of sorting, it became clear that my memories were richer than what I thought the boxes would conjure. My childhood memories weren’t stored in these boxes just waiting around to be accessed later. They just simply were. In fact, as I’ve mulled over it, my favorite sentimental thing would never fit in a neat little box. It’s my family’s dining room table. 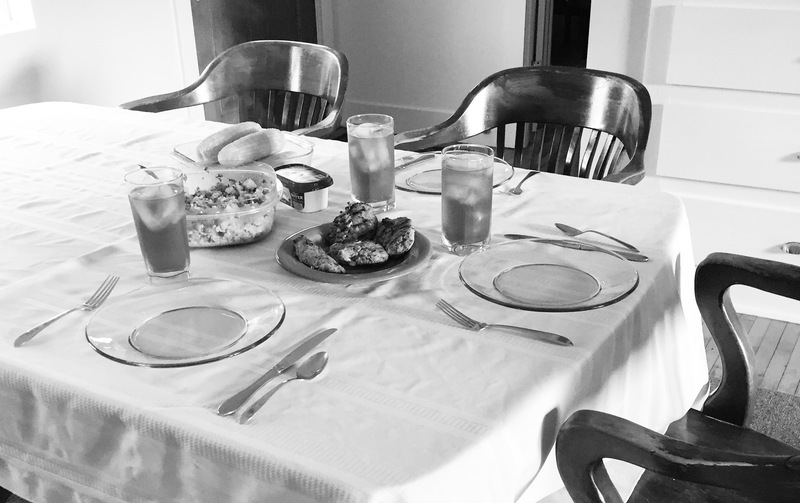 The table provided an environment in which my family learned, loved, laughed, and cried and was far more of an influential thing than any faded newspaper clipping, doodle, or nicknack I could have collected. Ironically and somewhat poetically, I watched the garbage truck haul away my junk at the end of the week while my mom and I conversed at the dining room table. I have to admit, it was a bit painful watching the things that I clung to for years get hauled off, but it was a good reminder that those things were not actually my memories. True memories would be cherished in my innermost thoughts and would inform who I am today. The before and after are amazing.